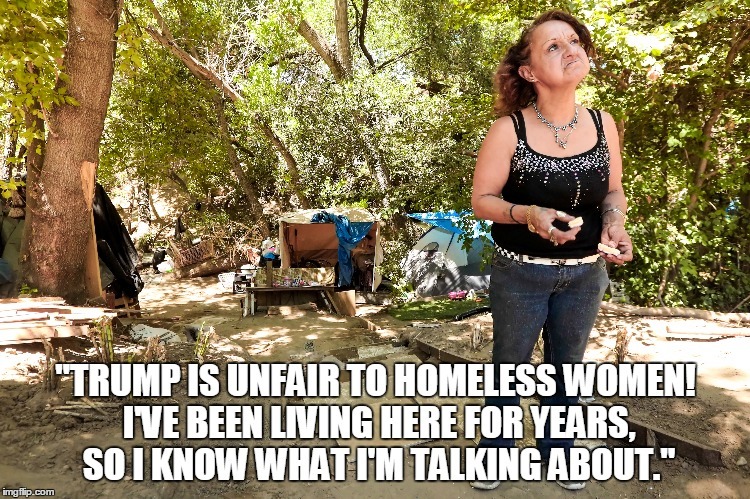 They’re the same do-gooders who encourage the homeless to answer questions in the annual Point-in-Time Survey, intended to show the need for increased funding to provide shelter / services for BUMS from all across America. This morning at Boulder Shelter for the Homeless the Homeless Philosopher said to the nice lady volunteer greeting everyone just inside the door, “Good morning — I don’t participate in the PiT.” Then I walked away . . . This entry was posted in Homelessness, Only in Boulder, Politics and tagged 2017 Point-in-Time Survey, Boulder Shelter for the Homeless, homeless advocates in Boulder, transients in Boulder County on January 31, 2017 by homelessphilosopher. Many of us who are homeless here try every day to exercise what I call positive peer pressure by holding the bad actors accountable, but it’s a losing proposition most of the time. 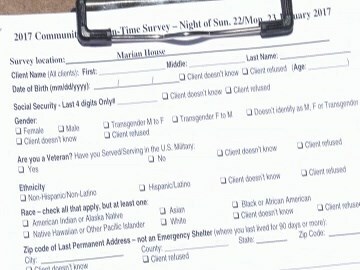 There is a way to eliminate 90 percent (my educated guess) of the problems — require a valid photo ID with a Boulder County address and proof of at least one year’s residency from anyone seeking shelter or services from any of the local nonprofits, such as Boulder Shelter for the Homeless or Bridge House. This is the policy of many homeless agencies around the country, including Haven for Hope in San Antonio, Texas. I’m now looking forward to more truth in our newspaper, and less baloney from the apologists/enablers. This entry was posted in Homelessness, Only in Boulder, Politics and tagged Boulder Shelter for the Homeless, Bridge House, Haven for Hope in San Antonio, require local ID for homeless services on January 30, 2017 by homelessphilosopher. What’s it all about? 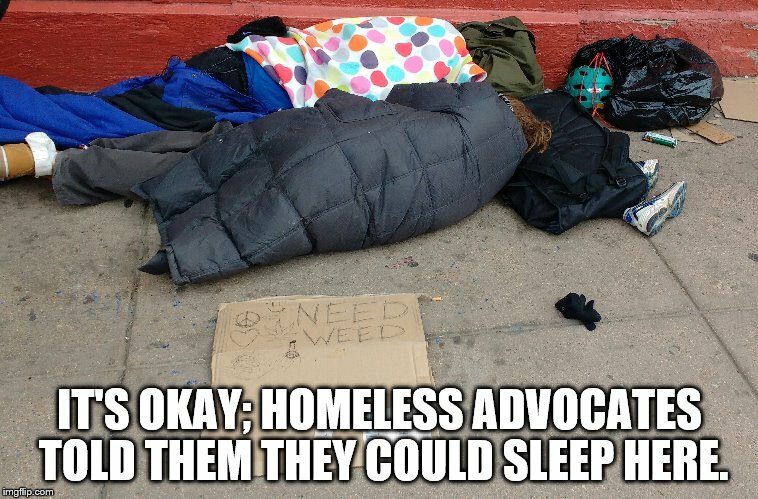 Metro Denver Homeless Initiative and Boulder nonprofits have one version of the truth, which seems harmless enough on the surface. Now, what’s it REALLY all about? This faux census of homeless people is a fundraising tool for the agencies that are supposed to deal with this issue; therefore, there is a powerful incentive to find as many “unhoused” men, women, and children to count as possible. There is NEVER going to be an end to homelessness under the current system, in which More Homeless People = More Money. This entry was posted in Homelessness, Only in Boulder, Politics and tagged 2017 Point-in-Time Survey, Boulder do-gooders, transients in Boulder County on January 28, 2017 by homelessphilosopher. See the story in the Daily Camera here. 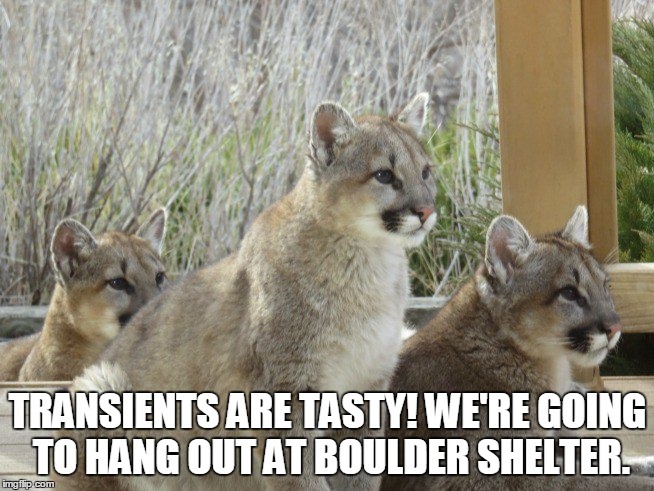 This entry was posted in Homelessness, Only in Boulder, Politics and tagged Boulder Shelter for the Homeless, mountain lion cubs in north Boulder on January 27, 2017 by homelessphilosopher. 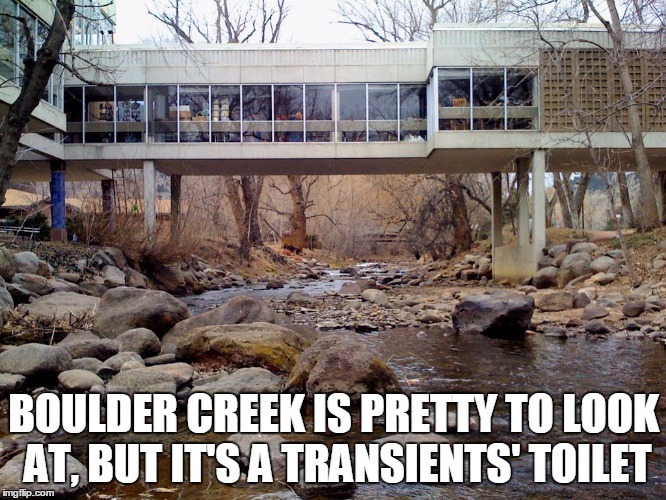 This entry was posted in Homelessness, Only in Boulder, Politics and tagged Betsey Martens Boulder Housing Partners, Boulder Creek, Greg Harms Boulder Shelter, Isabel McDevitt Bridge House, transients in Boulder County on January 26, 2017 by homelessphilosopher. The controversy over Milo Yiannopoulos speaking at CU tonight is not unlike the debate that goes on in our modest offices on an almost daily basis. We believe in free speech and we believe in decency. We do not think these beliefs are contradictory, but we understand that at the margins there will be differences of opinion about just where the lines are drawn. So, for example, we get letters condemning our editorial cartoons on a regular basis. The writers of these letters do not want merely to quarrel with the messages in the offending cartoons; they want us to know they should never have been published. A week ago we ran a cartoon making a rather predictable joke about the Donald Trump circus replacing the Barnum & Bailey circus, which had just announced it was going out of business. A reader complained it was stupid and juvenile, in bad taste, not “classy,” and should not have been published. Last weekend, we ran a cartoon which changed the presidential seal to incorporate Trump’s “America First” slogan and converted the American bald eagle into the Reichsadler, or German imperial eagle, which was a symbol of the Third Reich (and also the Second Reich in the 19th century, and the Weimar Republic). This, too, offended a reader who said we should not have published it. A few weeks back, a cartoonist illustrated the end of Obama’s presidency by replacing Porky Pig with Obama in the famous sign-off logo ending Looney Tunes cartoons, with Obama saying, “That’s all, folks!” A reader was offended, saying this was racist. “How could you?” he wrote. Editorial cartoons are intended to be provocative. It is our sense that readers on both ends of the political spectrum are quicker to be offended these days than in the past, but that does not stop us from publishing provocative cartoons because our function here on the opinion pages is to provide a platform for a wide range of views, including satirical and irreverent views. Which brings us to Yiannopoulos, the gay, British, sometimes blond-frosted, right-wing provocateur who has recently made it his mission to crusade against political correctness. Yiannopoulos believes that the left, and feminism in particular, have built a culture in which anyone who disagrees with their orthodoxy is by definition committing some sort of outrage. He is fighting back. Given the results of our recent election, it seems fair to say he is not alone in this view. The interview was occasioned by Yiannapoulos’s banishment from Twitter after he tweeted a series of insults directed at Leslie Jones, the “Saturday Night Live” cast member and star of last year’s remake of “Ghostbusters.” Yiannopoulos’s tweets, which qualified as trolling in the idiom of social media, triggered even nastier, more racist, more misogynistic tweets from various lowlifes who evidently felt Yiannopoulos’s tweets gave them license. Yiannopoulos replied he was not responsible for the acts of others and that famous Hollywood stars are not delicate flowers who require protection from free speech. Though we disagree with Yiannopoulos on most things, we confess to a twinge or two of identification with this sentiment. As a result of our criticisms of Boulder city government over the past couple of years, we have been accused of being impolite or inappropriate, of giving offense, of being outside the acceptable civic debate right-of-way. These accusations are mild forms of a very common tactic in leftist authoritarian countries, which is for those in power to delegitimize dissent by claiming it constitutes unacceptable behavior. We believe such efforts to stifle dissenting or unpopular views are more dangerous than those views themselves. Belief in free speech includes tolerance for speech many will find offensive. This is why the American Civil Liberties Union famously defended the right of Nazis to march in Skokie, Ill., back in the 1970s. Yiannopoulos was invited to speak at CU by two conservative student groups. When other students petitioned the university to disinvite him, Chancellor Phil DiStefano denied the request. “To be a university dedicated to the free exchange of ideas, our students should be exposed to views that are both in line with their beliefs and those that are not,” DiStefano wrote. We agree. This principle is one academia and journalism share. If you don’t want to hear Yiannopoulos, don’t go. You can also protest his appearance, although we would suggest that actually plays into his hands. The way to frustrate a provocateur is to ignore him. This entry was posted in Only in Boulder, Politics and tagged Milo Yiannopoulos, political correctness on January 25, 2017 by homelessphilosopher. You know, she might have a point — President Obama gave free cell phones to the homeless so they could stay in touch with dope dealers and each other. At Boulder Shelter for the Homeless, I overhear phone calls from guys sitting on the toilet to their friends in the nearby dining room, thanks to the American taxpayer. Top that one, President Trump! This entry was posted in Homelessness, Only in Boulder, Politics and tagged Boulder Shelter for the Homeless, Obama phone, Women's March on Washington on January 24, 2017 by homelessphilosopher.